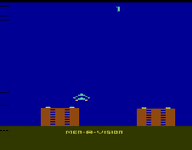 Air Raid, not to be confused with Air Raiders is considered to be the rarest game released for the Atari 2600. Its cartridge is a blue T-handle design with a picture of flying saucers attacking a futuristic city. It was the only game released by Men-A-Vision and had an extremely limited distribution, making it highly sought after by video game collectors. Source: Wikipedia, "Air Raid (video game)," available under the CC-BY-SA License.